Panelists at the tenth-anniversary symposium discuss how their time as Radcliffe Fellows helped them bridge boundaries between genres. 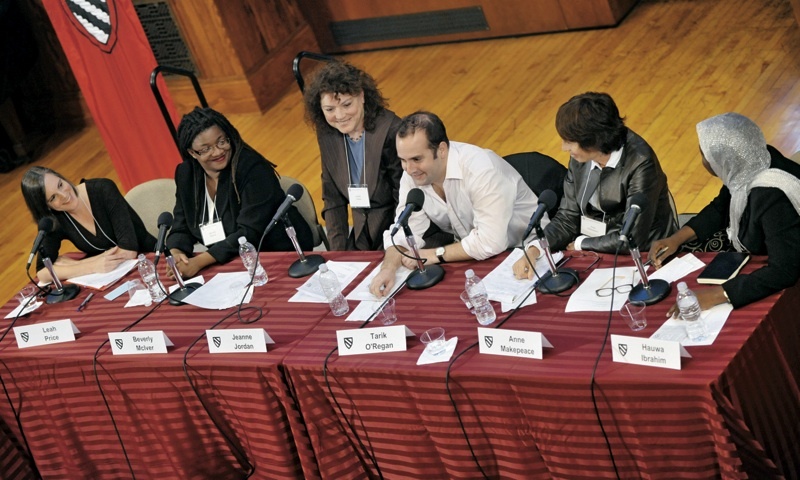 From left to right: English professor Leah Price, painter Beverly McIver, filmmaker Jeanne Jordan, composer Tarik O’Regan, filmmaker Anne Makepeace, and lawyer Hauwa Ibrahim. Ten years ago, Radcliffe ceased to exist as a college. But reincarnated as the Radcliffe Institute for Advanced Study (RIAS), it has done anything but fade quietly into history. Where some saw the end of an era, those guiding Radcliffe forward saw the potential for a new kind of greatness. Both the trustees of Radcliffe College and those acting on Harvard’s behalf “really did want to create something not just constructive, but imaginative and powerful,” Neil L. Rudenstine, the University’s president at the time of the institute’s creation, recalled at a symposium held October 8 and 9 to mark its tenth birthday. Those founders wanted “a refuge for scholars” that would also be “an active participant in advancing the University’s intellectual agenda,” the institute’s current dean, Barbara J. Grosz, said at the symposium. Grosz, who is also Higgins professor of natural sciences, joined the institute in 2001 as its first dean of science. (She became dean in 2008, after inaugural dean Drew Faust left for higher office.) In a November interview, Grosz said RIAS had met its major goals for its first decade: establishing an excellent fellowship program that draws scholars from a wide range of fields and advances thinking in culturally current areas such as stem-cell science and new media. The task for the next 10 years, she said, is rounding out the balance of RIAS’s offerings and integrating them more fully within Harvard. The program also enriches Harvard’s academic life through fellows’ talks and their participation in academic conferences, among other things. Radcliffe professorships also help the University recruit sought-after scholars with the prospect of spending two years (of their first five as Harvard faculty members) as Radcliffe Fellows. The institute “plays an especially important role for undergraduates interested in pursuing academic careers” by enabling interaction with scholars from around the world, says Scott Duke Kominers ’09, who regularly attended fellows’ presentations, lectures, and teas at RIAS as an undergraduate—and continues to do so as a first-year student in the business-economics Ph.D. program offered through the Business School and the Graduate School of Arts and Sciences. To that end, RIAS has launched a suite of Academic Engagement Programs (AEP), with six Harvard faculty members (two each in the arts and humanities, social sciences, and natural sciences) appointed as leaders. For one example, the directors for the social sciences—Aetna professor of public policy and corporate management Brigitte Madrian and Ford professor of the social sciences Robert J. Sampson—are leading a multidisciplinary group of scholars in designing the Boston-based “City as Social Science Laboratory” initiative, which will bring together academics, policymakers, and city leaders for policy and program development in areas such as crime, education, healthcare, and housing. Meanwhile, without backing away from the heavy emphasis it placed on science programming in its first decade, RIAS is also aiming to bring the social sciences and the humanities to the forefront. Though the fellowship program always included a strong contingent of artists—reflected in a riveting panel on fiction writing and rich presentations of artworks during the anniversary symposium—the AEP leaders are working with their Harvard faculty peers to solicit proposals for themed conferences (open to the public) and seminars (in which scholars from around the world, and often from different disciplines, assemble at RIAS to share their work with each other). The coming year’s offerings include a conference on gender and space in April, and another, on the history and future of the book, in October. In some ways, status as an institute has added to Radcliffe’s value as a resource for those who study women’s issues. As an example, Dunn cited the expanded holdings of the Schlesinger Library on the History of Women in America: during the last decade, increased funding has enabled the library to acquire 23, 400 printed volumes, some 8,700 audiovisual items, and 1,800 manuscripts. The library is also venturing into new media, devising ways to make personal archives in digital formats (e.g., e-mail) accessible to researchers; creating a website that showcases the contents of women’s travel diaries from the library collections; and archiving blogs that feature underrepresented voices and topics. Read a longer account of the tenth-anniversary symposium, with links to other relevant articles and websites, at harvardmagazine.com/radcliffe-10th.